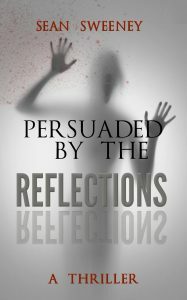 SeanSweeneyAuthor.com is proud to announce that his 27th novel, Persuaded By The Reflections: A Thriller, is now available for download at your favorite ebook retailers as well as in trade paperback. Persuaded continues the story of Ricky Madison, the protagonist from The Long Crimson Line. “For the last couple of years,” the author told his website, “I’ve been asked what happens to Ricky. Crimson has that cliffhanger there, and for a while I left it up to the reader’s interpretation. That was by design. Now I’m tackling what happens to him. Set in not only Boston but Worcester, Massachusetts, as well, Persuaded tells us the reasons why Ricky departed the Worcester Police Department, as well as taking a look inside the cases he worked on prior to his dismissal. Ricky also meets a young lady suffering in her own way. Head to the bookstore link to grab this title, as well as many others!